Ballymena United has issued an appeal for supporters to be on their best behaviour at Saturday’s Irish Cup semi-final against Portadown. The Showgrounds club found itself in disciplinary trouble recently over spectator misconduct reported by Irish FA match observers in the sixth round Irish Cup win at Cliftonville last month. They were initially fined £500 but the punishment was reduced to a warning after an appeal by United. 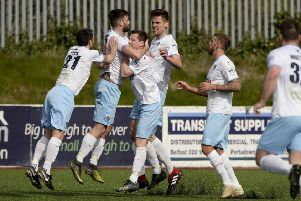 In a club statement, Ballymena said the club’s directors feared severe action if their fans were found guilty of further misbehaviour in Saturday’s teatime semi-final. “The Board of Directors, officials and players of Ballymena United want to encourage our supporters to create an atmosphere in the way we have come to see from the passionate Sky Blue Army over the past few seasons, however, we respectfully ask that this is done so within the boundaries of the stadium and IFA rules. “Ballymena United have a legal responsibility and obligation to refer anyone identified in this behaviour to the PSNI for prosecution and to enforce bans for supporters engaged in such behaviour. Spectator misconduct includes (but is not limited to) letting off incendiary devices (including flares), violence to other persons, damage to stadiums, throwing missiles and invading the pitch. It added: “We would ask supporters to follow the instructions of stewards and officials at all times and to report any untoward incidents at the earliest opportunity to safeguard other supporters on the day and protect the reputation of the football club. “Supporters and officials are working hard to raise income to allow our manager’s budget to increase, to promote ourselves as a family friendly club and to maintain the positive reputation of Ballymena United around the province.